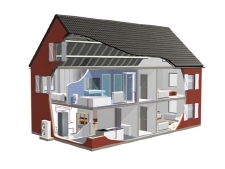 With ever increasing energy costs and major concerns for the environment renewable, sustainable forms of heating for domestic dwellings, commercial premises and public buildings are in everyone's interest. It's no longer just a case of lowest capital outlay, but running costs over the lifespan of the equipment and more importantly the carbon emissions generated by its use. With this in mind F&K offer a range of “ eco friendly” solutions for your home or business. Ranging from air source heat pumps that can heat and cool your living space and to provide hot water, ventilation systems for the entire house to reduce humidity and to improve air quality, heat recovery systems- constant fresh air without excessive heat loss and bespoke environmental control units for indoor swimming pools etc. F&K are MCS Accredited heat pump installers, enabling home owners and businesses to qualify for future RHI payments. We are Approved Daikin Altherma Installers , the highly flexible home heating system. With its inverter technology & built in weather compensator it is one of the best sustainable energy solutions for the domestic heating market.The range includes low temperature split and monoblock systems and the new high temperature split system capable of delivering 80c water for space heating and 70c domestic hot water without electric back up heaters. These units lend themselves to direct boiler replacement retro fitting. Click www.althermaflashhouse.co.uk/ for an interactive demo. The South West''s climate offers itself to the benefits of air source heat pumps with its relatively high winter temperatures and humidity, thus not requiring large amounts of ground space for ground collector coils etc. For clean safe electric heating we can offer a complete solution; no flues, no mandatory servicing, no excavating of precious gardens etc. For those existing ageing costly heating systems heat pumps offer an ideal retro fit solution. F&K are among the elite few of suppliers that can offer full after sales back up on the internals of the heat pumps it sells, covered by our team of qualified refrigeration engineers, giving you peace of mind for many years to come. Our workshop facilities now include a test bed for ground source units to enable testing and repair off site. Together with our mobile engineers who can service and repair heat pumps including, Daikin, Mitsubishi, Calorex, Viessmann, Worcester Bosch, Heatking and most other leading brands. If you are in need of assistance we are just a phone call away. Today''s government sees heat pumps as the future for sustainable heating in the UK . For more information or to discuss further the benefits of installing a heat pump please contact us. Click on the logo''s below for more information .